A map will tell you that a neat line runs from Chinatown down to Englewood, straight as an arrow along Stewart Avenue and Canal Street, lightly defining the borders of Bridgeport, Canaryville, and Armour Square along the way. Experience will tell you otherwise. The line is the great wall of Chicago: a formidable railroad embankment several yards high and often a whole block across. At any given moment, somebody is probably passing through its echoey shadow, where sunlight has scarcely shone since the Industrial Revolution. Always the trains run overhead: coal cars, the clattering Metra, the Lake Shore Limited on its nightly Rust Belt tour. Their passage shakes loose an inexhaustible supply of detritus from the tunnel ceilings: pigeon down, muddy icicles, chips of rotten paint. In 2015, just as in 1915, South Siders have learned to live with its busy racket. A different set of challenges begins at 47th Street, where the structure swells, practically becoming a neighborhood unto itself—in size, it approximates Chinatown. Inside sit piles of shipping containers, train tracks, and machines that shuffle the containers around. Spreading both east and west, reaching over a quarter mile in width, the space maintains all the way to Garfield Boulevard. From above, this lends it the bulging appearance of an unfortunate mammal stuck halfway through the bowels of a snake. This is the Norfolk Southern Railway’s intermodal shipping yard, and it is not being digested. Quite the contrary—rail shipping is booming in America, and executives at Norfolk (a titan of eastern rail transportation, recently valued at eleven digits) have long been preoccupied with how to expand their Chicago yards. According to a plan that was fully formed in 2008 and received the city’s emphatic blessing in 2013, the facility will spread south of Garfield by almost a hundred acres. The increased cargo capacity would give Norfolk’s operations a tremendous shot in the arm: more employees, more material, more noise, and more profit. The only thorn is that people still live in those hundred new acres, which comprise the northeastern corner of Englewood. Every year the story makes a brief round through the news; every year, these articles take on a sharper tone of inevitability. But the neighborhood is still a neighborhood: houses still stand on the streets, and lights still come on in their windows in the late-winter nights. Before Norfolk’s recent ambitions brought attention to this patch of the South Side, it was a place somewhat forgotten by time. It enjoyed a solitude born of peculiar city planning. Bounded snugly to the east and west by Norfolk viaducts only five minutes’ walk apart, and capped on the south by yet another viaduct, the area has few outlets to the world at large. This creates the feeling of a private courtyard or some alternate urban dimension, tucked secretly into a fold of the map like the middle of the trick page in Mad Magazine. According to its inhabitants, this isolation bred peace of mind—a happy exception among the many woeful narratives of Chicago’s midcentury population crisis. “We’re all by ourselves,” one resident serenely explained to Tribune reporters in 2011. “And nobody has bothered us.” Another went so far as to compare it to Mayberry, the neighborly setting of the Andy Griffith Show. Among the comely old frame houses and wide-open spaces, the brake-light sea of the Dan Ryan seems far away; so does Englewood’s commercial center, nearby at Halsted and 63rd. History has not furnished this subsection of Englewood with a name, but it seems to want one. 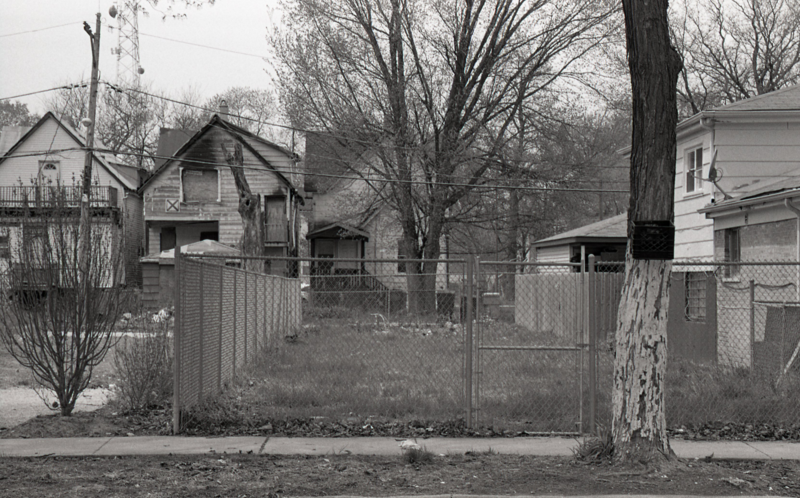 As a stop-gap measure, sociologist and photographer David Schalliol has taken to calling it “The Area.” A University of Chicago graduate student with far-flung interests, Schalliol learned about the Area’s crisis the old-fashioned way: by walking through it. 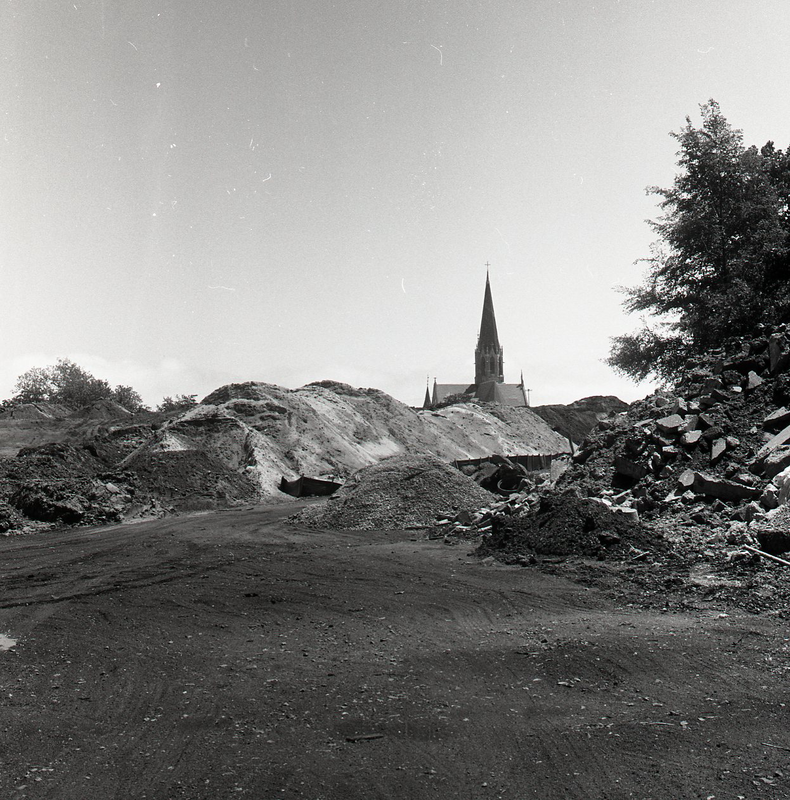 Realizing that a flurry of demolition activity was in progress in a small space, he began to investigate and meet residents “simply by spending time in the neighborhood.” His interest grew into a film project (also called “The Area”), which chronicles the neighborhood’s days of reckoning. A short teaser released in early 2013 displays the emotions prevailing at a time when the expansion project suddenly seemed like a concrete reality: dissent, dismay, resignation, and gallows-humor exuberance. Onscreen, the Fourth of July rolls around. “It’s the last one,” muses one resident after another, each wondering who will be left to celebrate the holiday next year. But sorrows are drowned in the lavish incandescence of crate upon crate of fireworks, likely acquired across a certain state line. As the camera lingers on houses lit up by the strobing display, it will be a stony viewer who is not moved by a sudden flash-forward cut to footage of one of those houses quietly buckling at the hands of a Caterpillar. Later in 2013, however, Norfolk sought to reject the stereotype of an arrogant private enterprise on the warpath against citizens. Its representatives stunned more or less everybody who was paying attention by announcing that the company would not only implement comprehensive environmental protections in and around its intermodal facility, but would also prepare a multimillion-dollar package of grants to a variety of neighborhood organizations. Sherwood Park, for instance, received a donation toward its long-term upkeep; local elementary schools got funds to enrich science and technology education; a retired viaduct along 59th Street was deeded to those who will see it converted into a groundbreaking linear park. In the years leading up to the 2013 announcement, organizations had expressed concerns about the expansion—Sustainable Englewood, the Resident Association of Greater Englewood, Blacks in Green, Englewood United Methodist Church, Northwestern University’s legal clinic, the Respiratory Health Association of Metropolitan Chicago, and more. Together they launched and sustained a campaign built on twin pillars of facts and feeling. Affronted residents drafted demands, appeals, and statements of principles. Medical experts were on hand to substantiate claims of health hazards, and legal staff caught City Hall in a trap of sorts by unearthing an earlier commitment to develop Englewood in a firmly residential direction. The city could not ignore this torrent of civic spirit. Municipal offices dragged their heels in approving Norfolk’s blueprints, and the company’s 2013 surprise announcement was the eventual result. This event scattered the campaign’s coalitions. It was a great day for South Side environmental justice, but the silver lining had a cloud: Norfolk still wanted its hundred acres, and the city was more inclined than ever to agree. 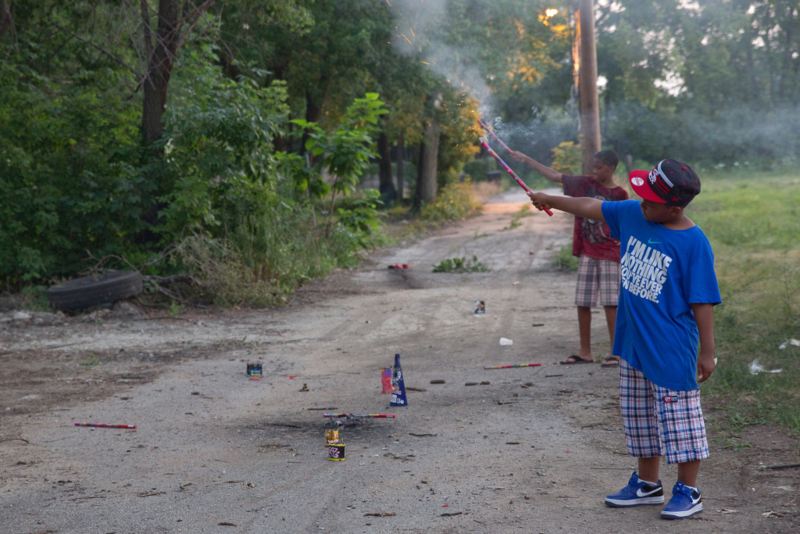 Englewood’s institutions were enriched, and its residents would be able to breathe deeply, but not on 57th and Normal. That was the deal, and to some extent it has burned bridges. Sustainable Englewood and the office of 20th Ward Alderman Willie Cochran exemplify the optimistic point of view. Visitors to their respective websites will be hard-pressed to find a sour note in their discussion of the Norfolk saga. Cochran makes a clean-conscience statement in celebrating the expansion of “the transportation and logistics industry in the 20th Ward.” Sustainable Englewood’s site celebrates its 2013 “Victory!” in forging “a positive and mutually beneficial partnership,” but describes the expansion itself as a done deal. Neither organization responded to a request for comment on the fate of those still living in the Area. Simply continuing to live in the Area might sound like a form of passive resistance, but it is becoming increasingly mighty in practice. Norfolk has begun preliminary work on the land it does own, resulting in an environment that is at best stressful but is sometimes nothing short of outrageous. The land is, after all, a live construction site interrupted occasionally by inhabited homes. Rogers observes that street signs have gone mysteriously missing and wonders how an ambulance would locate one of his neighbors in a time of need. At least one house seems to have been demolished without attention to the active gas lines, which spewed methane skyward until neighbors could smell it inside their own homes. According to Rogers, People’s Gas told residents they hadn’t been contacted to cap the gas lines. Payne walked outside one day and encountered a construction worker answering the call of nature in the open air. “At the beginning, the contractors that Norfolk Southern used in the community were helpful,” she remembers, wondering if Norfolk’s patience is nearing an end. Rogers anticipates an eminent domain action, through which Norfolk could essentially sue the homeowners for obstructing the greater good. If the courts agree, they would have the power to compel the holdouts to sell their homes quickly for a reasonable price. Rogers says the Coalition is prepared to persuade them otherwise. For the time being, the Coalition is trying to spread its message to a larger audience. It has produced documentary materials about the families remaining, and uses a Facebook page to publish reflections on the historical context of the expansion. Whereas earlier debate surrounding the project was of a measured, political nature, the authors of these new materials are not afraid of touching nerves. Norfolk’s agents are described as “rogue bandits,” City Hall is accused of serial South Side apathy, and the Coalition is intent on linking their cause to the civil rights movement. No stone is left unturned; several recent Facebook posts highlight the uncomfortable facts that Norfolk’s Virginia headquarters are adjacent to a Confederate monument site, and that many of the railroads that comprise Norfolk’s network were originally laid through black slave labor. These are grievances not easily addressed with a giant novelty check. More broadly, a cavalier attitude toward the land of marginalized neighborhoods is not hard to detect in recent headlines. A pricey helipad is under construction in riverfront Bridgeport; the UofC made multiple Obama library proposals involving public land under the (correct) assumption that City Hall would support them. The most extreme case is probably in inner-city Detroit, where a billionaire is busily acquiring a square mile of East Side residential land and converting it to a bizarre forest of decorative trees for reasons yet to be fully understood. This is not to suggest that large-scale land appropriation is a new beast in the city. Schalliol looks back on Chicago’s recent history and quickly finds “large institutions reshaping the city to meet broader economic and social objectives, including the construction of the Dan Ryan Expressway, the creation of the University of Illinois at Chicago campus, and the construction—and then demolition—of large-scale public housing.” These projects all affected larger regions than the Area, but what’s different with Norfolk and its contemporaries is that private interests are now originating and directing the plans, accepting the bulk of costs, liabilities, and—of course—eventual profits. The city’s role is to cooperate and enjoy the new tax revenue, not to pursue a particular agenda of transportation, education, or housing. This new paradigm will likely not go overlooked by other cities with high vacant acreage; businesses may be newly emboldened in their pursuit of urban territory, and municipal governments may be more inclined to sign it away. That’s good for South Lawndale, but Englewood demands to be understood in the context of a different urban dream: shady streets, urbane attractions, and peaceful bustle. For the majority of its history, the neighborhood was a fashionable and stately place with a green-colored name; the tracks that run over Garfield used to have pleasant passenger stations with long stone staircases down to the street, and Green Line trains used to be more than just occasional guests. The neighborhood had little to do with the world of industry. So by what magic was Englewood transformed into a landscape that must be partially fed to a company for its own good? Rogers, head of the Coalition, contends that the city would never dream of permitting a Norfolk-style land acquisition in wealthier areas like Ravenswood and Lincoln Park, and concludes that Englewood is institutionally perceived as a second-class neighborhood. He alleges a biased viewpoint that believes that once a neighborhood has fallen on hard times, it has to some extent forfeited its own self-determination, and ought to accept development in any form. Such thinking would lead officials to dismiss the Area as an insignificant territory in a game of much larger stakes, a sleepy little haven whose residents are suddenly seeing it through rose-colored lenses now that it might be on the chopping block. The foundation of this viewpoint doesn’t exactly meet the Building Code. 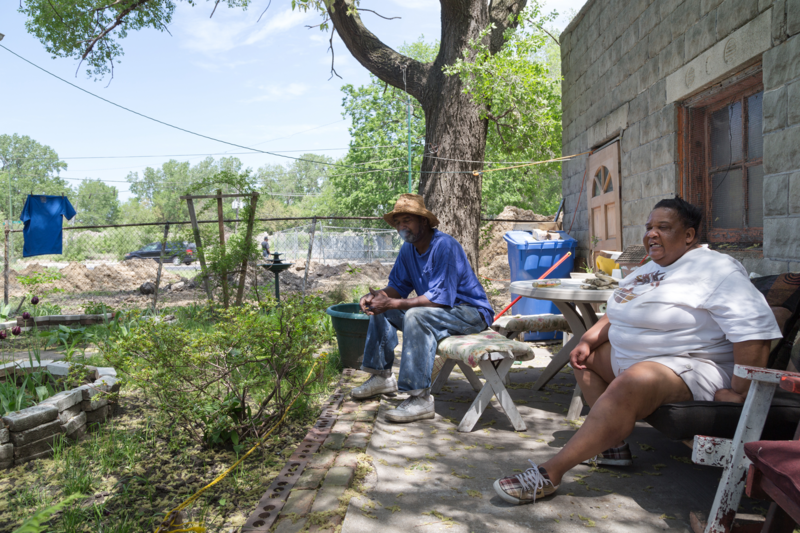 The Norfolk expansion has abundantly demonstrated that Englewood already has a conscientious community capable of expressing and fighting for its needs, which is ostensibly one of the key objectives of blight-fighting and development in the first place. Norfolk and City Hall are preaching the benefits of increased property tax revenue, but that is a reductive line of thinking. After all, what neighborhood in Chicago wouldn’t be more profitable if it were transformed into a business enterprise? Why not flatten Roscoe Village, which is just about as large as the total land that Norfolk Southern desires, and open a flagship IKEA? Moreover, one cannot look at a neighborhood that has fallen from a former splendor and conclude that its current residents are culpable for these ills. To manhandle a neighborhood in dire straits is, in practice, to penalize the people who are still living there—those who have not given up on it. A hypothetical homeowner in the Area circa 2010 is a person who successfully kept up a house through extremely tumultuous circumstances, kept up with their property taxes through the Great Recession, and stuck around in hopes of seeing change for the better. (Rogers and Payne have emphasized that many of their neighbors’ homes were in the middle of renovation and improvement when the crisis hit.) This is the behavior of a civic exemplar. If their final reward is a firm invitation to leave, the message is clear: why bother? The most ominous part of the map detailing Norfolk’s official plans is a remark proposing to “LOWER GARFIELD BLVD AS NECESSARY,” with the same designation for 59th Street. These streets may soon be charmless subterranean thruways much like the local section of 51st Street, which is simply a quarter-mile series of underpasses devoid of anything to distract the eye. 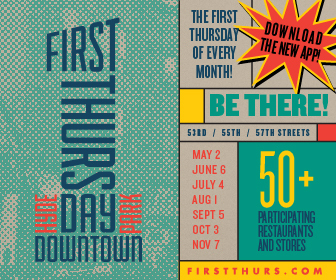 All other local streets from 47th to 61st will be closed at either end of the yard, if they are not already. Factor in the Dan Ryan running nearby and parallel to the obstruction, and the result is an enormous no-man’s-land across which friendship, cultural exchange, and basic continuity are deeply discouraged. Expect to see more of what’s on display in Fuller Park, which, many years ago, was the first casualty of the shipping yards’ expansion. That expansion, combined with Dan Ryan construction, created one of Chicago’s loneliest, most luckless neighborhoods; Norfolk continues to appropriate small parcels of the neighborhood for its own use, casting doubt on the long-term stability of the shipping yard’s borders. It is a further sticking point that “BLVD,” from the plan mentioned above, means “Boulevard,” or, in the language of the Chicago Plan (the great post-Fire document which envisioned a wholesome city both rational and natural), a bold artery of greenery within the system of lung-like parks designed to relieve the gray city’s tensions. Soon the Norfolk complex may form an artery of a very different sort, running both literally and symbolically at a right angle to the one endorsed by Daniel Burnham. This is one of the most beautifully written articles that I have ever read! Bravo to Andrew Lovdahl for his outstanding research, excellent interviews, amazing analysis and comprehensive storytelling that is close to poetic. Thank you for telling the story of the people of the Englewood Railway Coalition, who Norfolk Southern Railroad thought was powerless. Very articulate and clear article about corporate arrogance. I have one question about Englewood. Theirs nothing to save crime rate and murder is high and the police wont even police Englewwood its a eye soar. Who in the hell want to live in the hood. The residents are ghetto and liter and upkeep is like who does that. Englewoods once was beautiful place were all blacks wanted to live now look at it. Its called a project for a reason were the N project and have failed miserably tome and time again. Mark, you have no ideal what so ever. Yes, the Chicago Police do patrol the Englewood area. just like they patrol the entire city. Englewood has always been a beauitful area which, includes every being in the area. Put yourself in their shoes and let someone come into your area and just take your home away from you. Yes, my thoughts were just like yours, until I visit the area and talk to the people. Yes, I even spent a night there and experince the whole nine yards. I live in one of the modest area in the city. But truth to be told. I think you are part of Norfork Southern. I am saddened when I see this happening in the community I grew up in. I cried when I first saw the land empty. How did we allow this to happen?Why didn’t we pull together to save.the land and the.homes. I am posted off. There is no way that Willie should have got back in office. No one should vote.for the Mayor.to be reelected. I wish those that are left the best. This is so sad. The construction of the Dan Ryan doomed Fuller Park. The Dan Ryan is located halfway between the Metra tracks (former NY Central and Rock Island Railroads) and the Norfolk Southern tracks (former Pennsylvania Railroad). Fuller Park is so close to the NS yards and the Dan Ryan that you can’t get away from the pollution on either side. But unless the Dan Ryan is removed, there’s nothing to be done about that. Honestly, the thing to do would be to buy out the whole of Fuller Park and MOVE the buildings which are in good enough shape to relocate to the east side of the Dan Ryan, where there are lots and lots of vacant lots. At no cost to the residents. It’s a Chicago tradition to relocate buildings on rollers, so why not move entire blocks to a better location? It would help the neighborhoods east of the Dan Ryan. This would allow for the railyards to be expanded towards the Dan Ryan rather than south or west.